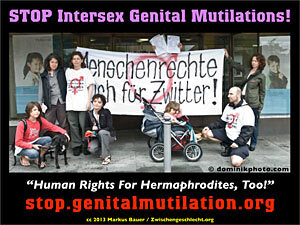 >>> “Fact Sheet Intersex” (PDF) which has been rightfully praised all over. Markus Bauer (StopIGM.org): “I particularly welcome how it actually spells out “ill-treatment” and “harmful practices”, two crucial and most powerful human rights frameworks still too often ‘overlooked’ when discussing intersex human rights, same as “access to effective remedy, including redress and compensation” included in the action points. “Together with the similarly brilliant German QueerAmnesty flyer on intersex (PDF), this is the new benchmark for adaequately adressing intersex rights from a LGBTQ perspective, while successfully avoiding the pitfalls of appropriation.